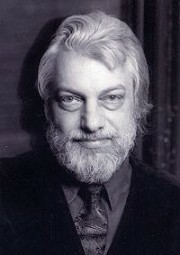 Nicholas Johnson is CoFounder and Senior Poetry Editor of Big City Lit (nycBigCityLit.com), an online literary magazine. For the past three summers, he has co-organized a series of readings and workshops in juvenile detention facilities, at libraries, and elsewhere in rural Greene and Albany Counties. He has taught creative writing for many years at the Payne Whitney Clinic and The Lighthouse in New York City. Johnson's degrees include an MFA in poetry from Brooklyn College, and an ABD from the Catholic University of America. Johnson has appeared in The Word Thursdays Speaking The Words Tour and Festival in Delaware County and was CoProducer of the 2002, 2004 Lyric Recovery Festival at Carnegie Hall. A MacDowell Colony fellow, Pushcart Prize nominee, and winner of The Lyric Recovery Festival Award 2000 at Carnegie Hall (Dana Gioia, judge), Johnson has published work in Rattapallax, The Journal, Poetry Wales, Pivot, Mudfish, American Letters & Commentary, Shenandoah, American Poetry Review, Confrontation, Chance of a Ghost anthology, and other literary magazines. His new chapbook, Degrees of Freedom, is now available from Bright Hill Press. All work reproduced with express permission of Bright Hill Press. I'm watching him. My teeth are as sharp as steel. "With metaphoric dexterity and an uncanny ability to invigorate common expressions so that they become pure poetry, Nick Johnson writes his poems with skill and candor. The opening of each poem in 'Degrees of Freedom' parts the sky with perceptual lightning, and by the time we finish, a devastating clap of truth's thunder rolls in, taking the poem and us by storm." "Nicholas Johnson is a poet of incandescent wit, the kind of mordant intelligence whose first target is its own assumptions, and a strange haunted tenderness. I love his work for its dark, 'sotto voce' orginality. This is a collection that the writing community has been waiting for." 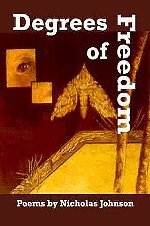 "Nicholas Johnson offers a view from the author's desk with imagery both amusing and sinister in ["One of the Monkeys" from the chapbook Degrees of Freedom, published in March of this year. To mark National Poetry Month, NPR.org is featuring a series of newly published works selected by the Academy of American Poets."